With the lobbyists now advocates for private prisons joined hand-in-hand with compliant politicians, it's a sure thing delinquent citizens will again be thrown into 'government' prison as they were over 200 years ago. The bankers will get their pound of flesh and governments are their agents to do just that. Says SCRUFACE in his article Abolished in 1830, Debtors Prison returns to the United States: "
If people don’t start paying attention, I think the day may soon come in which wealthy multinational corporations will have levied complete dominance over our government and these types of laws become a lot more prevalent. We have to begin to recognize the influence that banks and corporations have on our government and force a change, or the day may come in which working people are no more than twenty first century indentured servants. This has been a struggle that has ensued since the dawn of civilization." Some lawmakers, judges and regulators are trying to rein in the U.S. debt-collection industry's use of arrest warrants to recoup money owed by borrowers who are behind on credit-card payments, auto loans and other bills. More than a third of all U.S. states allow borrowers who can't or won't pay to be jailed. Judges have signed off on more than 5,000 such warrants since the start of 2010 in nine counties with a total population of 13.6 million people, according to a tally by The Wall Street Journal of filings in those counties. Nationwide figures aren't known because many courts don't keep track of warrants by alleged offense. In interviews, 20 judges across the nation said the number of borrowers threatened with arrest in their courtrooms has surged since the financial crisis began. The backlash is a reaction to sloppy, incomplete or even false documentation that can result in borrowers having no idea before being locked up that they were sued to collect an outstanding debt. The debt-collection industry says such errors are extremely rare, adding that warrants usually are sought only after all other efforts to persuade borrowers to pay have failed. PAY UP, OR LOCKED UP: Jeffrey Stearns, of Indiana, spent two nights in jail over a $4,024.88 debt. Earlier this month, Washington state's House of Representatives passed by a 98-0 vote a bill that would require companies to provide proof a borrower has been notified about lawsuits against them before a judge could issue an arrest warrant. 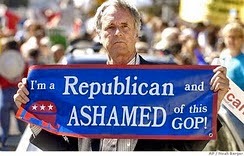 All 42 Republicans voted for the legislation, which is expected to pass the state's Senate and be signed into law by the governor. A trade group representing debt collectors supports the bill and says the changes are needed because some companies are abusing Washington's existing law by improperly arresting borrowers. In Florida, training this week for dozens of new judges and sitting judges who are moving to courts with the power to lock up borrowers includes a session about potential abuses of debt-related warrants. "Before we take away a person's freedom, we want to ensure that there are procedural safeguards," said Peter Evans, a Palm Beach County, Fla., state-court judge who proposed the session. Some judges elsewhere are issuing fewer debt-related arrest warrants because law-enforcement officials complained those cases gobble up resources needed to pursue violent offenders. Illinois regulators are investigating the use of warrants by debt collectors and other financial firms doing business in that state. In September, the Illinois Department of Financial and Professional Regulation issued an order seeking to revoke the license of Easy Money Express Inc. The Paducah, Ky., payday lender won arrest warrants against at least four customers. One spent five days in a Carbondale, Ill., jail last March after failing to pay a $275 debt, court filings show. The lender "exploited the court system to obtain the arrest and incarceration of its customers," said Sue Hofer, a spokeswoman for the agency. The company declined to comment but is fighting the state's proposed ban. At the national level, the Federal Trade Commission began scrutinizing in July the use of arrest warrants in debt-collection lawsuits. An FTC spokesman declined to comment on whether the inquiry has led to formal investigations by the agency, which oversees the debt-collection industry and enforces a U.S. law that restricts how borrowers can be pursued for debts. Arrest warrants generally can be issued if a borrower defies a court order to repay a debt or doesn't show up in court. Retailers, credit-card issuers, landlords and debt collectors are the most frequent seekers of such orders, according to court filings and interviews with judges and lawyers. Encore Capital Group Inc., ECPG -0.54% the largest publicly traded debt-buying firm by revenue, last year began requiring law firms handling its cases to follow a "code of conduct" that includes this sentence: "Under no circumstances should a firm cause a consumer to be taken into custody involuntarily." J. Brandon Black, Encore's president and chief executive, said the San Diego company decided to stop threatening borrowers with jail because the practice made Encore look bad. 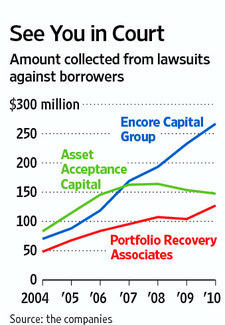 The company filed 425,000 lawsuits against borrowers last year, up 27% from 334,000 in 2009. Last year, officials in McIntosh County, Okla., south of Tulsa, issued about 1,500 debt-related arrest warrants, up from about 800 a year before the crisis, according to a court clerk. More than 950 borrowers got similar warrants in Salt Lake City courts last year. Maricopa County, Ariz., officials issued 260 debt-related warrants in 2010. Few orders result in jail time. For example, in Piatt County, Ill., just five borrowers were arrested last year out of the 13 hit with debt-related arrest warrants. The sheriff said he puts a higher priority on tracking down people accused of violent crimes. "I wish I could do it more," said Piatt County Circuit Judge Chris Freese, who has heard hundreds of debt-collection cases. "It's often the only remedy to get people into court and paying their debts." In one of those cases, Emmie Nichols, 26 years old, was arrested in June at her mother's house after lawyers for Capital One Financial Corp. COF -0.58% won an arrest warrant against her for skipping a court hearing about $1,159.87 she owed on a credit card from the company. The $500 bond that freed Ms. Nichols from the county jail was turned over to Capital One as a partial payment of the debt, court filings show. A Capital One spokeswoman declined to comment on Ms. Nichols. Some judges are worried that the jump in debt-related arrest warrants is creating a modern-day version of debtors' prison. The practice ended in 1833 after decades of controversy, since borrowers owing as little as 60 cents could be held indefinitely in squalid jails until they paid off their debt. Earlier this year, Vanderburgh County, Ind., Superior Court Judge Robert Pigman asked Indiana's highest court to review the legality of debt-related warrants after law-enforcement officials complained they can't quickly access arrest orders for dangerous criminals because their computer system is clogged with debt cases. The Indiana Supreme Court hasn't responded to the request. In September 2009, Jeffrey Stearns, a concrete-company owner, answered a knock at the door from a Hancock County, Ind., deputy sheriff. The deputy was holding a warrant to arrest Mr. Stearns for not paying $4,024.88 owed to a unit of American International Group Inc. AIG +1.32% on a loan for his pickup truck. 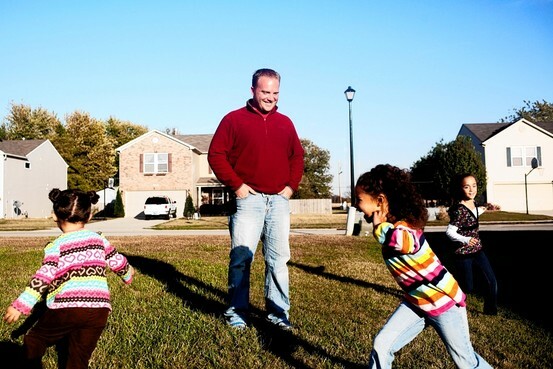 After being handcuffed in front of his four children, Mr. Stearns, 29 years old, spent two nights in jail, where he said he was strip-searched and sprayed for lice. Court records show he was released after agreeing to pay $1,500 to the loan company. "I didn't even know I was being sued," he said, though he doesn't dispute owing the money. "It's the scariest thing that ever happened to me."